Did you know that my mom writes book reviews, too? She does! She loves to read and acquire books just as much as I do. She especially loves to read cozy mysteries. I have two guest reviews from her today that originally appeared on The Friendly Book Nook. 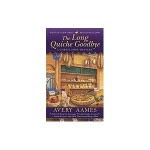 She got to these books much faster than I did...she has quite the appetite for cozy mysteries! :) Also, she's adapted to using an ereader much faster than I have (I still haven't) Isn't that funny? Here are her reviews! Enjoy and please visit The Friendly Book Nook and say hello to her as well. Daughter Amy gave me this book because she knows I love cozy mysteries. I read this book in two days. The story was engaging, the characters likable and this is the first book in what I hope are many more. Grace is by herself, single, parentless, but she has obtained the job of her dreams. Almost as soon as she is hired, she encounters problems she wasn’t expecting and the police are understaffed which leaves it up to her to (help) solve the mystery. Along the way I encountered some heart pounding situations which made me continue turning pages to find out what would happen next. This was a fun new book and I look forward to many more in this series by Julie Hyzy. She has also written the White House Chef Mysteries, and I think I may look up those as well! This is a great addition to the cozy mystery genre. I LOVED it. The characters have a French bend. The main character has what would be called a “nontraditional family.” The idea of a cheese shop with cheese products and cheese recipes is awesome. The mystery is engaging with twists and turns at times, yet there is also character building along the way. The main character, Charlotte, is very easy to relate to. She is a single 30 something, yet she is helping to raise her cousin’s eight-year-old twin girls. Some questions are left unanswered meaning, hopefully, that this is the beginning of a series of books! Watch for the release of this book. If you love cozy mysteries, you will love this book!